I wrote these words last year when I met Penny at the Galley. From the outside the space has no form. The door could be a gate to a yard or a garage. Inside it has qualities of both burrow and bunker. A long straight room where you can’t see everything at once. A slither of white walled space, in which we spend a one-hour segment of time. Penny and I talk about language, the difficulties of verbalizing artwork. Her drawings suggest narratives but deserve freedom from words. They don’t start out fully conceived, instead growing slowly from her unconscious mind. They aren’t necessarily finished when she initially stops working on them, she revisits them over time, resisting overthinking, applying more marks, more pressure. They are totemic; populated by figures that are more or less people, though they may be trees or birds, characters from novels that might have been. Aliens, birds, moon faces; all conversing, enquiring, embracing, or often just being. Mostly peaceful, but some of the titles hint at power-plays. All rendered in pen on paper in the artist’s distinctive mode; full of secrets and symbols that the artist keeps. She doesn’t outright reject the interpretation that her drawings have a darkness, but it is the ambiguity of her work that she aims to make the only constant. It is not words, but rules that Penny really resists. Rules, definitions and categorization. She trained as a fine artist so sits outside of the ‘outsider’ group (although shares the automatism they often practice, and which was bought into the canon by the Surrealists and Dadaists). Sometimes she identifies as an illustrator, although this epithet doesn’t quite fit. It suggests that text comes first, when in reality, if stories relate to Penny’s drawings at all, they come afterwards. Penny has been drawing for herself since art school. She carries the three drawings she is working on at any one time tucked inside a book. The works suggest ritual and obsession so it is pleasing to discover these qualities are inherent in her working process. She draws at home, on her lunch break, or sometimes in the reading room of the library. Outside influences when they have occurred have served to provide a burst of confidence and permission to do whatever she wants without justification. What does the future hold? Sat amongst around fifteen monochrome works on paper of identical size, one work – Animal – holds a clue. Penny has considered saying goodbye to black and white and embracing the world of colour. Another possible avenue is to translate the drawings into prints; from etching-a-likes into etchings themselves. She has also been inspired and excited by the possibility of dip pens and by researching the human brain. Underscoring the potential for change and experimentation lies a practice that does not need to change: one that the artist is happy with. A means for Penny to process visually. To absorb thoughts and feelings – and faces, of family, friends or brief acquaintances – by osmosis onto the page. Progression, she concludes, is breaking rules. We should all be able to move more freely. They say that some offices are paperless. But mine is not. Most of my memories are held in paper: photographs, books, the stubs of boarding passes from beautiful holidays, exam (and birth) certificates, drawings and letters produced by old friends. Paper has a way of folding history and memory over and over until they become an object with the strength of a samurai sword. These are my feelings as we enter an exhibition which is not so much curated, as selected and placed. There are no long catalogue entries here, no panels of text on the walls, no narratives to be told. The gallery is full of humour, draughtsmanship, beauty, contradictions and conceptualism. The gallery in question is Saatchi Gallery in the West end of London, and it belongs to the infamous septuagenarian art collector and former advertising agency executive, Charles Saatchi. The exhibition is called simply: Paper. We step directly in to the durational spaces of Dawn Clements; annotated with time and other notes that help her capture the experience of living. The artist uses pen and ink to create detailed, intense scenes across multiple sheets of paper, haphazardly strung together to architectural effect. We nod in agreement when one visitor says “these are incredible!” as he stands with chin in the air to get a better view. Next we walk past Jessica Jackson’s sofa made of newsprint, sat on by a family of papier-mâché pots, into a gallery full of dark omens: a child is restrained so that another can scrawled his torso with hateful words, and imagery from the archive of a Nazi facility is transcribed in delicate pencil. In Tal R’s drawing, someone is giving birth to a primitive-looking mask borrowed from Picasso or Brancusi, with tiny cut-out eyes. Scribble and scrawls all have currency here but it doesn’t mean that the subjects are trivial. A consummate advertising professional: Saatchi understands that visitors to his galleries should experience no negative feelings. The walls are perfect and white, the floors impeccable. Natural light streams in wherever it can. You want to take a picture and tweet it? Go ahead. Modernity and pleasure are his languages. Rebecca Turner’s paper pulp tumour grows out of the gallery wall and into a conversation with a giant crumpled paper bust by duo José Lerma and Hector Medera. They are aggressively physical; however, we wonder if they are meant to be as silly as they appear. In the next room Miller Lagos has made branches from newspaper; sliced so we can see how old they are, a hint that this retrograde material might one day exist only in archives. Saatchi Gallery’s themes tend to be broad – in 2006 at its previous location it heralded The Triumph of Painting; in 2008 the inaugural exhibition at its current premises was The Revolution Continues: New Art from China, and in 2011 the gallery held Gesamkunstwerk New Art from Germany. Sometimes Saatchi alights upon an area of the visual arts that has become unfashionable, other times he is ahead of the curve or just behind it. In this case the latter is true as many organisations in the UK have investigated paper and drawing practise during the last decade. The Drawing Room gallery has been active in London since 2002, last year Paper Gallery opened in Manchester; Tate Britain held a blockbuster show called Watercolour in 2011, which was followed in 2012 by a survey of drawing at Tate Liverpool – a city that is home to a duo who produce a quarterly publication and regular events under the name The Drawing Paper. But Saatchi Gallery does offer something unique. It bridges the gap between the mysterious art world of wealthy collectors and the public museum. Using tremendous resources and 70,000 square foot of space it can gather the most freshly made artworks from all over the world (in Paper, 44 artists in total from the UK, USA, Belgium, Germany, France, Brazil, Spain, Puerto Rico, China, Austria, Israel, the Democratic Republic of Congo, Japan and Greece are represented) in one place. The Paper exhibition is not the result of scholarship, but Saatchi has an eye for the interesting as well as the enduring; each work is powerful and accomplished and it’s hard to find an exhibition quite like this anywhere else. “Stand still, and I will read to thee / A lecture, love, in love’s philosophy / These three hours that we have spent / Walking here, two shadows went / Along with us, which we ourselves produced / But now the sun is just above our head / We do those shadows tread”… These are the opening words of John Donne’s 17th-century metaphysical poem, A Lecture Upon The Shadow, which lends its title to the outcome of a collaboration between ShanghART, Shanghai and Open Eye, Liverpool. ­To linger over Donne’s poem for a moment before we enter the exhibition in its second incarnation ­at Open Eye; there is both hard and softness (‘lecturing’ contrasted with ‘love’) and powerful imagery in the form of the shadow. It talks about time and change, and the phases of love. Phases, changes, and, indeed, metaphysics (a strand of philosophy concerned with abstract thought, being, time, causality and trust) can all be found in this exhibition if you look for them. There is a playful attitude towards light, as well as a long dark shadow cast by a gaggle of less than law-abiding CEOs. The artists are divided into groups of three to occupy the two spaces that make up the ground-floor exhibition area – both countries represented in each room. David Penny (pictured, above) says of his work (displayed alongside Liang Yue and Man Yi in the first space) that it is the outcome of an interest in “still life, unwanted things… [and] photography as a productive device”. He photographs images, torn from art books and made into delicate sculptural objects, applies a colour filter and finishes them with a box frame; a process beginning and ending with an image, transforming the ephemeral into the substantial. Either side of Penny are images that are painterly but at the same time recall 1990s fashion magazine photography; disregarding the need to sit firmly in either figuration or abstraction, or to stick with colour or black and white. They suggest stories (Man Yi, is that water running down the street or blood? ), intimacy, loneliness; there are Kusama-esque spots of colour, textures, journalism; but the experience is not chaotic. They share a sensibility with images on instagram or flickr; but those websites struggle to preserve this much engagement in the medium of photography. In the second room, Tabitha Jussa describes how, having not spoken to any former residents in her research process, there were many at the opening who wanted to “share their histories and memories” of the place in her image. She has produced a composite image, but hyper-real, not invented. New-build housing peeks through the spaces between formerly grand homes built by an Edwardian philanthropist. This kind of vista will be familiar to many people who live in Liverpool, due to the dramatic fluxes in population through the decades, and doubtless well intended changes in policy. ‘Policy’ is a word that hangs slightly menacingly in the air in this room. The final UK artist, David Jacques, isn’t dealing with conventional world leaders or authorities, but rather the new-world order of Chief Executives of multinational companies. Here they are shown as caricatures in perverse narratives; their faces, copied from corporate websites, are given Nazi uniforms and lizards’ tails. This project is a departure from his usual text-based work but consistent with his politics (it was too much for the Chinese authorities, who prohibited its showing in Shanghai). But, despite its dark subject matter, there is something comical in its ‘Ickean’ conspiratorial urgency. The last Chinese artist has an articulate but cautious message, which is complemented by Jussa and Jacques. Fan Shi San’s Two of Us series mourns the siblings that never were due to the one child policy that controls population growth in China. Fan’s images, of all the artworks in the exhibition, embed themselves in your mind’s eye: the bleak settings and heartbreaking facial expressions communicate the loneliness many experience as a consequence of being only children. Each pair of figures look sadly away from each other, unable to offer comfort to their imaginary twin. Twinning is an appropriate theme, as it is likely the reason that this exhibition came to be. Liverpool and Shanghai have been ‘twinned’ since 1999. There are some obvious reasons for this particular pairing: both regional capitals gained their wealth and character through their ports, which acted as windows to the world. In A Lecture Upon The Shadow, we are invited to consider the similarities and differences of these two locations, and also offered an example of what is possible with a collaboration between a private and a public organisation. Visually, the art of these six artists sits easily together, despite the variety of approaches. There is inquisitiveness and questioning (of life and the photography process) which can be found in all of the artists. Perhaps the curators borrowed Donne’s imagery as even after 400 years academics cannot come up with a definitive interpretation of his poem, and so it provides only the loosest of frameworks. However, curatorial looseness doesn’t diminish enjoyment, the artists are individually memorable and collectively they produce a show of very high quality. If this exhibition was to come up with a definition of drawing – which it deliberately hasn’t done – it would explain that drawing, unlike painting, isn’t intrinsically linked to a medium. Instead, drawing is a deliberate attempt to represent something. This ‘thing’ does not need to exist (although it can do or have done) it can be imagined or remembered, or it could be an idea or a concept, but the drawing after the thing always remains, as traces. This exhibition is Tracing the Century: Drawing as a Catalyst for Change at Tate Liverpool, curated by Gavin Delahunty, its Head of Exhibitions and Displays, and by Katherine Stout, curator of British contemporary art at Tate Britain. Both have extraordinary credentials in the field of drawing: Gavin was curator at Middlesborough Institute of Modern Art (mima) and Katherine co-founded the Drawing Room, in London in 2001. With this just one of a number of recent blockbuster shows on promoting drawing. The question is: is drawing having a moment or is this the beginning of a permanent change in status for works on paper? Downstairs my viewing experience begins in a darkened room accompanied by the fuzzy hum of a projector. This is a display running alongside the main exhibition; a new commission by Matt Saunders called Century Rolls. To create his images, Saunders shines light through paintings or other barriers onto photosensitive paper. 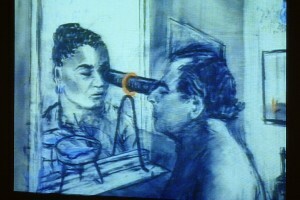 The result is the first of many examples of drawing embedding itself in modern art making processes. Besides his photographs, Saunders creates animations; which, in spite of their monochrome palette reminded me of fauvist art – a branch of Impressionism characterised by bold colour and blocky brush strokes. Upstairs for the headline show, the fauvists make another appearance, represented by Paul Klee. Almost straight away his drawings make me think about music, and all that mark-making can communicate. The marks on the paper are almost making sounds in my brain. Klee is part of a selection of four artists (along with Paul Cezanne, Richard Hamilton and Lee Bontecou) whose work is shown together. The quirk of this exhibition is that the interpretation hinges on these groupings, rather than picking out themes. Gavin describes the timeline of the exhibition as leaping “back to the future,” as it links pieces with theoretical and visual sympathies rather than in any way acknowledging their chronological order. The exhibition tries to trip up its visitors with sculpture, new media and even little bits of paint. 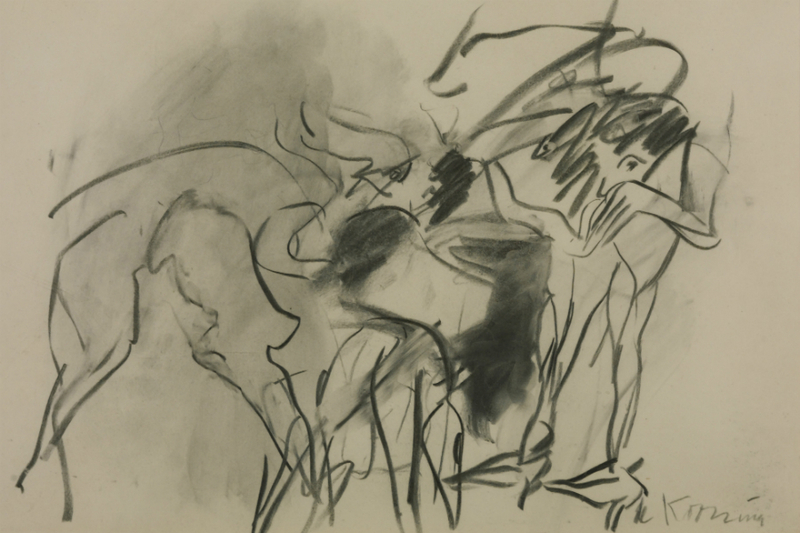 The piece that blows open the debate about what drawing is, is Henry Moore’s Recumbent Figure. It isn’t a very large example of Moore’s work in stone, but it is nevertheless monumental. It is possible that the sculptures are here as a curatorial device to ‘lift’ the show; as well as or instead of because they really are drawings. However, Gavin explains that they have put sculpture in, “second place,” and by placing it alongside unexpected comparative pieces given it new meanings. Moore is part of a “sexually charged” selection of works including pornographic images by Cornelia Parker, feminist art by Hannah Wilke and intimate pen and ink drawings by Andy Warhol. Tracing the Century demonstrates a legacy of the recent Tate Liverpool exhibition, Turner Monet Twombly. That show took the same risks in showing historic, modern and contemporary art together (something Katherine says is: “quite hard to do… but there is a curatorial and public appetite for it”) to tell a new sort of art historical story that has little to do with style or ‘ism.’ In that show abstraction and figuration (as in Tracing the Century) was under the microscope and both shows demonstrate how lines of inquiry are passed from generation to generation. This exhibition has given Gavin the chance to revisit the “phenomenal collection of drawings” at mima. His former employer holds a world class collection of American post-war drawings, some of which will become part of Tracing the Century when the show tours there after its showing in Liverpool. This will potentially create “new relationships” between exhibits as well as offering something new for audiences who have already seen the show at Tate. Tracing the Century has created a meditative space; where visitors can learn that drawing can be durational and powerful, as well as ephemeral and emotional. After seeing this exhibition it is hard to think of visual art without drawing as a backbone. Perhaps the traditional low regard for works on paper is the reason that there are still plenty of new ways to interpret drawings, by artists but also by arts organisations through their exhibitions and curatorial emphasis. It remains to be seen whether drawing will take up its place at the heart of art discourse, but the story of drawing is evidently ongoing. I recently spent a nostalgic weekend in Norwich. Nostalgic in a Cath Kidson and cupcakes way for a time and objects that were not really like that the first time round. I lived in Norwich from 1990-2003; however, my decade in Liverpool has made me a tourist in my ‘home’ city, which allows me to enjoy Norwich – and Norfolk’s – offer in a way I never did as a resident. Lamb feeding, cobbled streets, antique shops and cream teas all featured in this outrageously kitsch trip. But I injected a bit of edge with a taste of English whisky at St George’s distillery, a delicious lunch in The Bar at Cinema City (a genuinely independent cinema with an adjacent bar-restaurant in a converted medieval building), a drink in the shabby chic York Tavern and an excellent exhibition at NUCA Gallery (the gallery attached to Norwich University College of the Arts). Against the backdrop of the self-proclaimed ‘Fine City’, the artist books of the Coracle publishing house work very well. A selection of Coracle’s output is on display at NUCA until 21 April 2012 in the exhibition Printed in Norfolk: Coracle Publications 1989-2012. Coracle is a printer-publisher, which set up in London in the 1970s, directed by artist and writer Erica Van Horn and poet and artist Simon Cutts. In 1996 they moved production of their distinctive brand of small-edition books and works on paper to South Tipperary Ireland, but for a short period in the 1990s also operated another base in Norfolk. Some of the books are linguistic-visual puns; others illustrate poetry, or are the outcome of little ideas like wondering whether artworks can be produced from envelope interiors. The books are displayed next to printed lolly sticks, ceramic houses or other quirky objects that inspired them; they reference art history, illustrate poems, and are often the result of collaborations. Collaborators have included environmental artists Richard Long and Hamish Fulton. The imagery and typography that they employ have not strayed far from the approach that they established in the 1970s. Springs of rosemary, cottages, fungi, tables and twisted miscellaneous metal items all appear in distinctive pared-down form. Hand-writing is contrasted with printed text and many pages are left intentionally blank. As the Arts and Crafts movement 100 years earlier applied to its textiles and decorative arts, Coracle has taken the mass-produced printed book and given it the care and attention of a hand-crafted one-off. Many editions are contained within beautiful slip-cases, sewn, ring-bound or presented as a series of cards. I particularly like the work of Van Horn, either on her own or collaborating with Cutts or others. It might be a bit gentle for some tastes, but for me Van Horn’s drawings capture small observations and over-looked forms and make them timeless and important. I first saw Van Horn’s work in the exhibition A Private Affair at the Harris Museum and Art Gallery in Preston where her work was shown alongside contemporary artists such as Roger Hiorns, Chris Offili, Tracey Emin and Grayson Perry. There is a streak of anti-establishment and art criticism in Coracle’s output as well, which keeps the work fresh and challenging. Coracle embodies a utopian spirit that could exist in the past or the future, where like-minded people can join together to make a living and help other people to imagine alternative ways of being. It is a shame that they had to close their satellite branch as the ideology of this small publishing house works well in a city where history, modernity and contemporary life seem to co-exist peacefully. NUCA has partnered with the Book Hive, an independent book shop round the corner on London Street, to offer many of the current titles for sale. The prices range from £5 to £40 for books and up to £100s for a limited edition print (these can be purchased directly from their website at http://www.coracle.ie/index.html). Judging by the visitors to the exhibition and the custom in the Book Hive, as well as the company’s longevity, there is definitely room for this kind of home-spun publishing in the 21st century, and it can hold its own alongside e-books and ipad apps. Sometimes it is nice to slow down the pace of life, and Coracle feels like the equivalent of taking a break from urban living to eat a cream tea by the river. There are plenty of other great eateries, visual arts and music venues, shops and architectural treats in Norwich, but I spent the last day of my visit at Happisburgh, a seaside town around 20 miles east of the city. This strange reflective place is losing its coastline at a rate of around 12 metres a year. As a visitor attraction, this is fascinating, as the debris of former homes along the coast, buffed into smooth chunks, mingles with the stones, shells and seaweed. If you want to think about the power of nature or the inevitable passing of time, this is as good a location to do it in as any. Norwich, and Happisburgh, is not as well known as it should be; possibly because the motorway peters out at Coventry if you are travelling from the west of England, and at Cambridge (1.5 hours away) if you are travelling from the south. There is a special quality to Norfolk, which I attribute to its proximity to London, while at the same time feeling remote and removed from the rest of the country. You have to make a special trip – as it isn’t on the way to anywhere – but if you can make the time, Norwich is well worth a visit.